It takes less than 60 seconds for me to feel like I’m queen of New York. One of the fastest elevators in the world – a guaranteed ear popper – propels me 102 floors up to the One World Observatory. This is the three-floor viewing gallery that opened a year ago in the new One World Trade Center. You can pay extra to rent a tablet to explain the views digitally, or just ask one of the enthusiastic human “global ambassadors” for free. On the 100th floor are 360-degree views that take in the rivers snaking around Manhattan, the other four boroughs, the Bronx, Brooklyn, Staten Island and Queens – and on the clearest of days you see five states. As far as views go, this really is to infinity and beyond. This tower would never have been built without the tragedy of September 11, but there is only a fleeting reference to the Twin Towers in a high-definition time-lapse video shown in the five Sky Pod elevators, tracking the growth of Manhattan from the rural 1500s to the urban jungle of the present day. One World Observatory is about looking forward, not back. But you only have to peer down at the ground to see a reminder. The 9/11 Memorial – two water feature pools sitting in the footprints of the former towers – is right next to this new skyscraper. It makes sense to do the 9/11 Memorial & Museum with the One World Observatory in the same day, but steel yourself, the museum has harrowing content. The entrance is between the pools on street level – visitors descend a gently sloping ramp past remnants of the original structural columns. At the foundation level of the original towers there is a historical exhibition, recounting the timeline and personal stories of September 11, and a memorial exhibition, showing the names and faces of the nearly 3,000 victims, and rotating tributes by loved ones. The level of personalisation and the recovered artifacts stun me into silence. Mangled fire trucks. Blood-stained shoes. A flashlight that two workers used to safely descend from the 84th floor of the North Tower. An eerie photograph of a woman standing at the impact hole of the North Tower – we know she is moments from death. I skip out some accounts on purpose – it still feels so hauntingly real. It’s a relief to emerge into the sunshine and look upwards. Although 9/11 will always be inscribed on New York’s soul, the new One World Trade Center, the fourth tallest skyscraper in the world, is proof of the city’s resilience. Reinvention is New York’s middle name, and as a fourth-timer visitor, I have no trouble finding fresh things to do, new twists on classics and hidden secrets. I have walked through Grand Central Station before, but had no idea there was a cocktail bar in its upper reaches, the Campbell Apartment. Il Buco Alimentari & Vineria in NoHo is another recommendation that hits the spot with its artisanal Italian dining in a lively atmosphere. Just north of Noho is Madison Square Park – where we stop for a nightcap in the newly opened New York Edition and strike gold – the hotel’s Gold Bar has a horseshoe bar crafted entirely from 24k gold leaf. There’s always something new to watch in the world’s most famous theatre district and I opt for Paramour at the Lyric Theatre. Cirque du Soleil’s latest attempt at cracking Broadway. The singing, dancing and acting is classic Broadway, blended with the risky acrobatics that made Cirque a household name. Opening an original show on Broadway can be a risk in itself, but judging by the standing ovation, the omens look good for Paramour. With more than 100 museums, New York has enough culture to keep you going for weeks. One of the coolest spaces is the Whitney Museum of American Art. The collection recently moved into a Renzo Piano-designed building in the Meatpacking District. Light, airy galleries let the art do the talking. Windows and terraces look out over the High Line – it’s a natural progression to leave the gallery and meander along the historic freight rail line, which bridges the gap between street level and the skyscraper level. 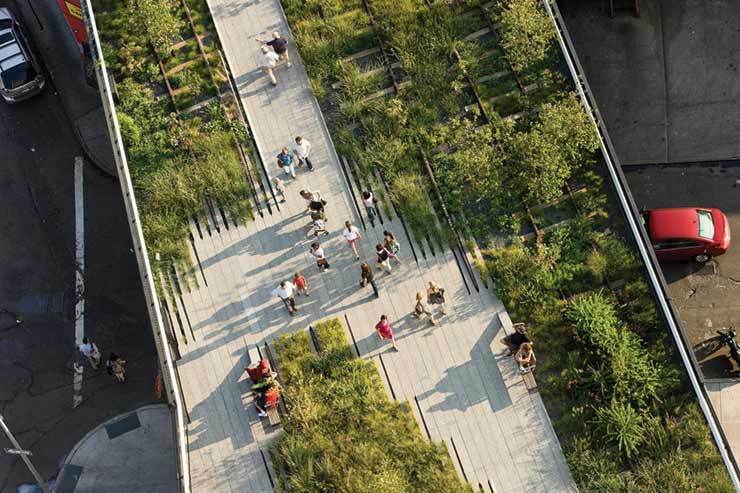 The High Line opened in stages between 2009 and 2014. It now stretches for 1.45 miles from Gansevoort Street in the Meatpacking District to West 34th Street, with 11 access points. I first walked the line when it felt like an insider’s secret. Not so now. On a sunny Saturday, it is pulsing with New Yorkers and tourists. We admire the wild gardens while munching on a gourmet picnic from nearby Chelsea market. On previous New York visits I haven’t ventured further north than Central Park, so on a Sunday morning, I strike out to Harlem, taking the metro north to 132nd/Malcolm X. It’s a wet, dismal morning for a walking tour, but our spirits are revived by gospel music in a vibrant church. Lunch also comes with a serving of gospel, as we tuck into southern soul food at Harlem institution, Sylvia’s. Get a table in the lunchtime rush and you’ll be singing Hallelujah, but its popularity makes the atmosphere. Sometimes in New York, it’s good to go back to what you know. Like the Empire State Building, a boat trip around the harbour is a classic. I take to the water in a restored clipper dating back to 1854. We sail out to Ellis Island and back for a close look at Lady Liberty and a panoramic view of the downtown skyline, where One World Trade Center feels well established. There’s no longer a gaping hole where the Twin Towers stood. New York is back, bigger and better than ever before. And I know I’ll be back too.